Here's a story about income inequality that isn't about the top one percent, or the banks, or greedy chief executives, or taxes. It's a story about geography. It begins in Austin. Perhaps the most dynamic city in the recovery, the capital of Texas benefits from a great big university, a thriving tech scene, a favorable business climate, an equally favorable actual climate, and cheap living costs for a city with so much bustle and demand. Thanks to low living costs, it's been a great place for middle-income families to find work and settle. And they really have. Austin's pool of middle-skill jobs has grown four-times faster than the national average, Conor Dougherty reports in the Wall Street Journal. Austin is a "brain hub." 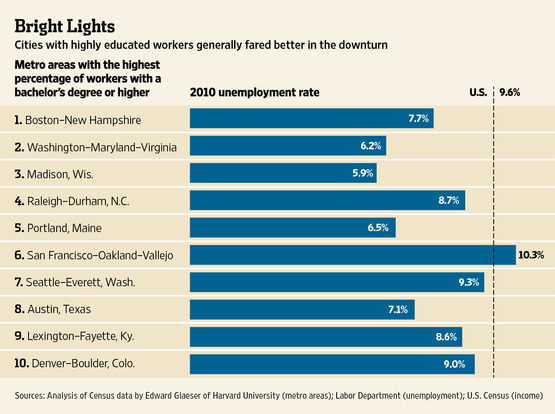 It's got the eighth highest share of college-educated workers in the country. It's not like other brainy metros ... but in a few years it might be. There are two types of brain hub, Brookings' William Frey told Dougherty. First, there are cities like Austin, Raleigh, and Madison. You can think of them as the next generation of the Great American City. They're growing fast, adding lots of young college grads (partly because they're home to a great university), but for a number of reasons, have a more diverse mix of educated and less-educated workers moving there, as Dougherty explains. Second, you have the old guard of D.C., San Jose, San Francisco, and parts of New York -- talent magnets attracting the best and brightest. These cities have thrived for decades. They've also gotten very expensive to live in. High prices create a feedback loop of rich talent. Lots of talented rich people go there, but also low-income workers who can't afford the new speed have to leave. Something to worry about if you're worried about income inequality is that as talent attracts talent, some of (or parts of) these next-gen metropolises are going to look more like D.C. and San Jose. Living costs will rise with wages. Richer families will cluster in richer neighbors. Low-income families who can't afford the new prices will have to leave. This takes them further from opportunities in the city. The gap will grow between the haves and the have-nots. The sorting of high-educated and lower-educated families is a part of the income inequality story, even though it's an externality of a pretty positive development, which is smart people trying to work and be together. You might start at the city-by-city level by pursuing housing policies that allow residential and business construction to mix so that we raise the supply (and control the inflation) of housing units. We can also think creatively about how to extend college education at an affordable price to the 65 percent of 20-somethings who don't have a degree. The bottom line is helping the 99 percent find equal opportunities goes way, way beyond marginal tax rates for the top one percent, or doling out punishments for the corporate suite.